BYZANTINE EMPIRE. Romanos III, 1028-1034 AD. Gold Histamenon Nomisma. Very rare without nimbus. BYZANTINE EMPIRE. Romanos III, 1028-1034 AD. 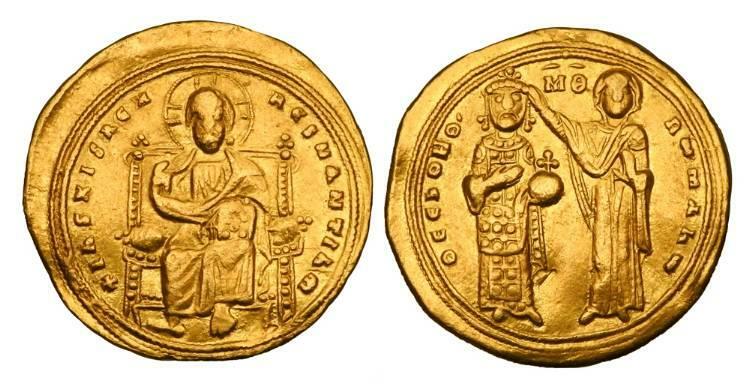 Gold Histamenon Nomisma (4.39 gm) of Constantinople. Christ enthroned / Romanos blessed by the Virgin Mary. S.1820. VF+. Very rare without nimbus. BYZANTINE EMPIRE. Basil I, 867-886 AD. Cast AE14 Half Unit of Cherson. BYZANTINE EMPIRE. Basil II, 976-1025 AD. Æ Anonymous Follis.